A world where everyone can thrive & it starts by telling your story. 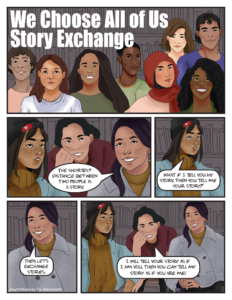 Encourage Idaho middle school/junior high school or high school students to participate in the We Choose All of Us Story Exchange to build empathy and understanding in your school and community! This challenge is based on the ideas from Colum McCann and Narrative 4’s Story Exchange. Step 1 – Choose a prompt for your story. Download the facilitators guide for more information and prompts on the themes! Step 2 – Find a partner, tell your story; then exchange! Everyone needs to find or be assigned a partner for the story exchange. It works best with someone you don’t know very well. Each partner should have 10 to 15 minutes to tell their story. Once you and your partner have had a chance to listen to each other’s story, join two to four other partner groups (the ideal number for the story share is 10 people in a group along with a teacher/trusted adult to help hold the space) and have each member of the larger group tell their partner’s story using the first-person point-of-view. Immediately upon finishing the story exchange, debrief as a group how it went by starting with the prompt: “Choose one word to describe how you feel right now.” Go around the circle and give everyone who wants a chance to share time to do so. All individuals, students in a class/youth groups, or the entire student body (when at least 75% of students participate) who enters the Story Exchange Challenge and scores over 80 points will receive a We Choose All of Us T-shirt! 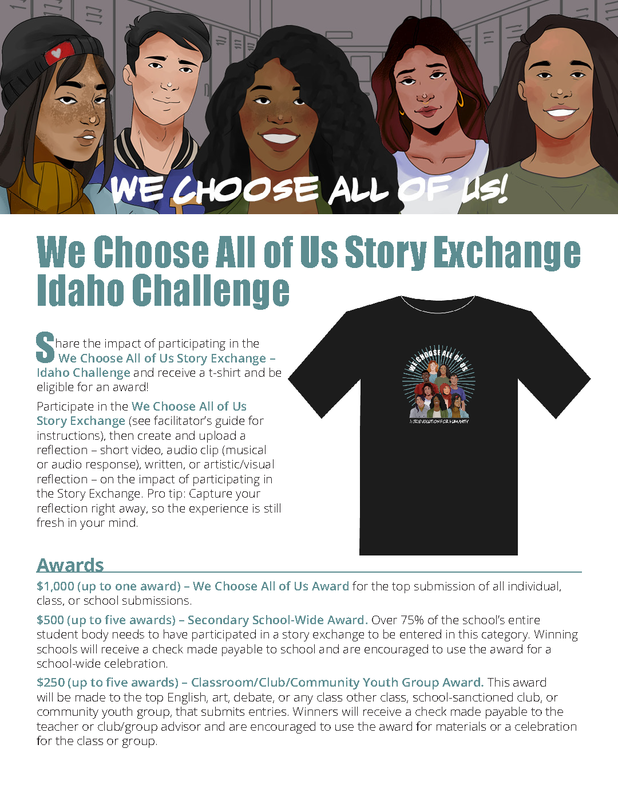 Idaho middle school/junior high school or high school students are eligible to submit either as individuals or as a classroom, school-sanctioned club, or community group, or as a school-wide submission if over 75% of the school participates in the Story Exchange Challenge.